Donuts: Preheat an electric griddle to 375 degrees. In a mixing bowl, whisk together flour, baking powder and salt. In a large mixing bowl, whisk together milk, eggs, 2 tablespoons vegetable oil, applesauce and granulated sugar until well blended. Add in dry ingredients and mix until combine (batter should be slightly lumpy, don't over-mix). Pour half of the batter into 2 sandwich size ziploc bags and seal bags. Brush preheated griddle generously with vegetable oil. Cut about a 1 inch corner off the ziploc bag (while holding it with the tip pointing upward so the batter doesn't pour right out), then carefully pipe donut shapes onto oiled griddle. Donut Glaze Syrup: Melt butter in a medium saucepan over medium heat. Once butter has melted, stir in powdered sugar, salt and milk. Whisk until sugar has dissolved completely then stir in baking soda and whisk for about 30 seconds until frothy. Remove from heat and stir in vanilla. 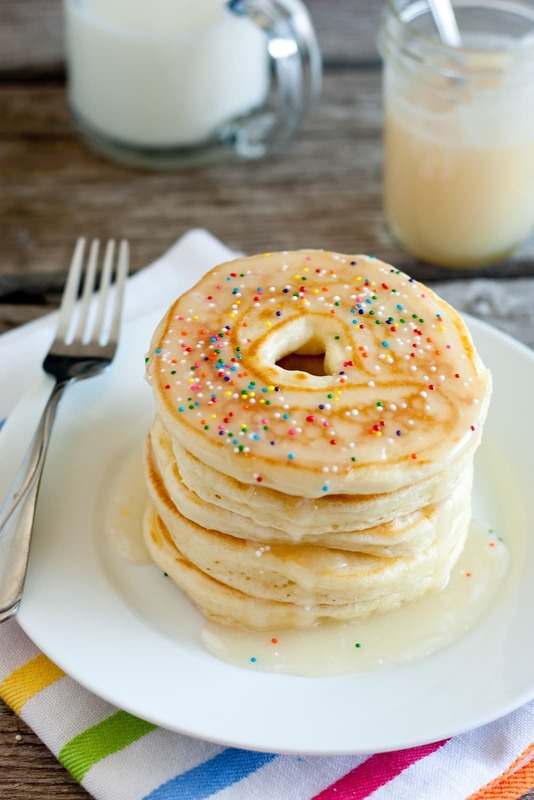 Serve warm over Doughnut Pancakes. Store in refrigerator up to one week.